My Android Studio project used to build faster but now it takes a long time to build. Any ideas what could be causing the delays? I have tried https://stackoverflow.com/a/27171878/391401 but no effect. I dont have any Anti virus running which could interrupt the builds. My app is not that big in size as well (around 5MB) and it used to build within few seconds but not sure what has changed. It will reduce 90% gradle build time. Found the reason!! If Android Studio has a proxy server setting and can't reach the server then it takes a long time to build, probably its trying to reach the proxy server and waiting for a timeout. When I removed the proxy server setting its working fine. After deleting above lines, it builds in seconds. We're aware that build times are an issue with Jack right now. We have improvements in the 2.4 Gradle plugin that should be a significant improvement for incremental builds. Recommended Reading: How I save 5h/week on Gradle builds! @AndroidDev solution worked for me. I had included the whole lib in gradle. Changing to solved the problem. From 4 min to 1 min. Check your Internet connection. If internet speed is very slow gradle build will also take long time to build. I check by change my wifi internet connection with another one good speed connection. Now build time is normal. Please try this before you go to other solutions. somebody will take wrong decision to reinstall or change settings. I hope it will help. Thanks and regards. 1) My build time severely increased after i added some new library dependencies to my gradle file, what turned out that i need to use multidex after that. And when i set up multidex correctly then my build times went up to 2-3 minutes. So if you want faster build times, avoid using multidex, and as far as possible, reduce the number of library dependencies. 2) Also you can try enabling "offline work" in android studio, like suggested here, that makes sense. This will not refetch libraries every time you make a build. Perhaps slow connection or proxy/vpn usage with "offline work" disabled may lead to slow build times. 3) google services - as mentioned here, dont use the whole bundle, use only the needed parts of it. In the beta version of Android studio 2.0, they've rolled out a feature called Instant Run. It reduces the build time by a big factor. The core concept is, Android Studio only pushes the small changes made into an already running app. It classifies the changes we make in our code to three parts: hot swap, warm swap and cold swap, based on how much load would the change would put on the build. After that, it simply swaps the code in the already running app and we get could see the changes running a few seconds. See their doc for more information. Here you can download Android Studio 2.0 preview. PS: There are a few issues with this feature. They've listed it out at the docs. Check it out before installation. I was facing the same problem for a long time but I solved it by adjusting the settings in gradle. This should reduce your build time. DroidArc and AndroidDev solutions where useful, but not enougth. My problem was related with my Windows 8 OS and its 100% disk usage. Especially the Windows Search service, was the most consuming. Disable it with: cmd(Admin) >net.exe stop "Windows search"
Mark the checkbox named: Offline Work. The move above was erratic also and therefore I sought to find out if the problem may be the processes/memory that ran directly on either my phone and computer. Here I freed up a little memory space in my phone and storage (which was at 98% utilized - down to 70%) and also on task manager (Windows), increased the priority of both Android Studio and Java.exe to High. Take this step cautiously; depends on your computer's memory. If the script/function/method I'm debugging is purely JAVA, not JAVA-android e.g. testing an API with JSONArrays/JSONObjects, I test my java functions/methods on Netbeans which can compile a single file and show the output faster then make necessary changes on my Android Studio files. This also saves me a lot of time. I tried creating a new android project in local storage and copied all my files from the previous project into the new one - java, res, manifest, gradle app and gradle project (with latest gradle classpath dependency). And now I can build on my phone in less than 15 seconds. In your build.gradle, if you have minifyEnabled for debug, remove it. I had it in my project and it took ~2-3 minutes to build. After looking at build progress, I found this as culprit, so deleting the commented line below, my issue was fixed. 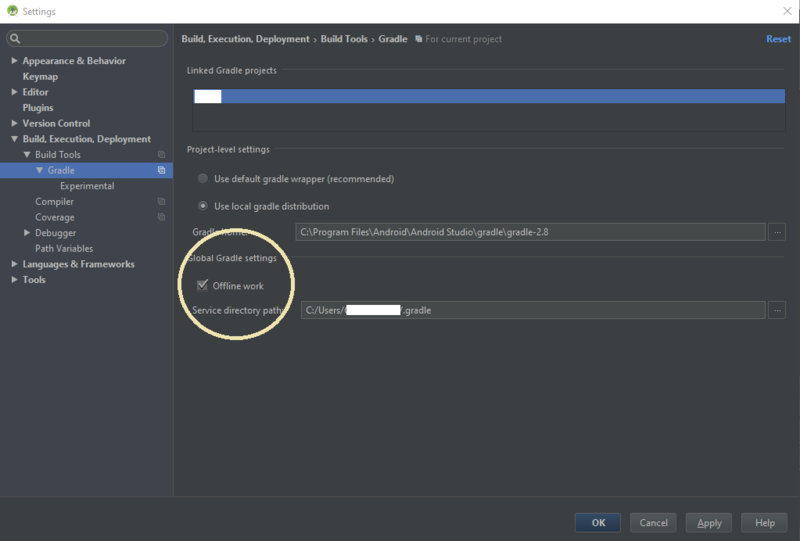 You could try the tips in this post Why your Android Studio takes forever to build - Part 2 One of the tips recommmends "Enable offline mode" among other things. I had a similar issue on my computer. Windows Defender was blocking some part of Gradle Building. I've disabled it, worked fine after that. Try restarting your computer and running Android Studio again. Worked for me when trying to build a Cordova / Phonegap project with an Android target codebase. Not the answer you're looking for? Browse other questions tagged android android-studio build gradle build.gradle or ask your own question.